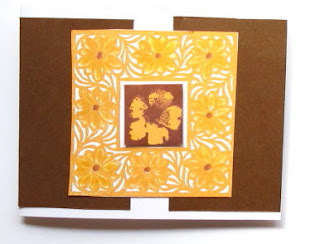 In this version of the Mother’s Day Card, the flower frame takes on a supporting role. A blender pen was used to color in the flowers from the frame stamped image. Here is the complete list of materials used to create this card–Cardstock: White and Brown, Inkadinkado® Flower Garden, Frame Stamp, Vivid! Brown, ColorBox® Pigment Stamp Pad Limited Edition Curry, Blender Pen, Foam Mounting Tape and Aleene’s® Original Tacky Glue®.